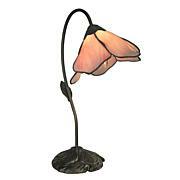 A modern twist on a classic Tiffany design, our Cavan accent lamp will glow brightly in any room in your home. 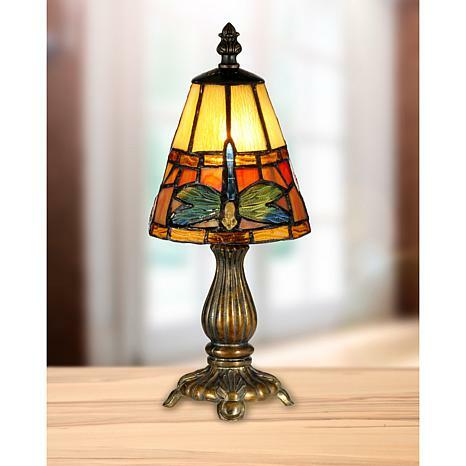 The top of the cone shade is sunny amber art glass panels, and a broad band of fiery orange, red and dark amber runs along the bottom edge. Large dragonflies with cool, iridescent blue green bodies and light amber heads provide crisp contrast to the warm earth tones. 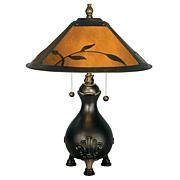 The elegant metal base features a reeded column and intricately cast pedestal with fan detailing. Cavan easily accents any decor style and will add a bright splash of color to your home or office. 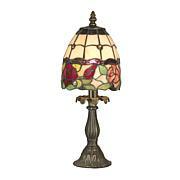 Beautiful Accent Lamp - I Love it! 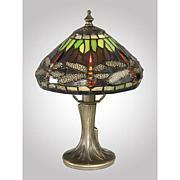 This is an adorable lamp, and now one of my favorites. I have it on a small table by my fireplace, and it adds ambience to the room. Suspended from a support column, this lamp appears to be floating in mid air. The signature look and appeal of the overall design, paired with its commanding height, ensures that this lamp will easily be the focal point in your space.